Michael Ignatieff takes aim at Stephen Harper after a student was removed from a Conservative event in London because a Facebook photo showed her posing with the Liberal leader. Liberal Leader Michael Ignatieff is accusing Conservative Leader Stephen Harper of performing more rigorous background checks on people showing up at his campaign events than advisers he hires in the Prime Minister's Office. Ignatieff's verbal jab at Harper comes after reports the Conservatives threw two university students out of a Conservative rally in London, Ont., on the weekend. Awish Aslam, a second-year political science student at the University of Western Ontario, told CBC News she and a friend were trying to attend a Sunday rally with Harper when they were asked to leave by an RCMP officer. Aslam said they were led to the lobby where the officer told them they were no longer welcome because they had ties to the Liberal party. Aslam said the only explanation was her Facebook profile photo showing her posing for a picture with Ignatieff at a recent Liberal rally in London. The Liberal leader told reporters during a campaign stop in Newfoundland and Labrador that "you are in a very un-Canadian place" when citizens get tossed from public meetings for having "a certain Facebook friend: me." Harper sidestepped questions on the ejections at a campaign stop in Quebec on Tuesday morning, saying only his staff manages his events and that he could not comment on a specific situation. "There are hundreds of people who are coming out to our events. There are hundreds of people I meet with every day and I think the campaign is going very well," Harper said. Aslam said she had to pre-register for the Conservative event Sunday, which is how the party had her name and that her friend's father, who is a Conservative party member, helped them fill out the online form to get on the list. Aslam said she wanted to hear directly from all the main party leaders and had also attended a rally with NDP Leader Jack Layton. While Aslam, 19, said she has no political affiliations and has not made up her mind on who she will vote, she did say she did do a few days of volunteering for the provincial NDP when she was 16. At a later press conference in Ottawa, Conservative candidate John Baird said Harper's spokesman Dimitri Soudas is planning on apologizing to Aslam. Contacted earlier Tuesday, Aslam said she hadn't yet heard from Soudas, who has said he was making arrangements for Harper and the student to meet when the campaign next comes through London. But Baird wouldn't answer repeated questions from reporters about the screening process and why the students were thrown out. He would only say that there's "not room for everyone" at these events and that they have to manage how many people can attend. Instead, Baird hit back at Ignatieff, saying the Liberal leader shouldn't be criticizing Harper for un-Canadian actions after spending years outside of Canada and introducing a platform that the Conservative candidate said would raise taxes and kill jobs. "I just think that Mr. Ignatieff should be the last person in this country, certainly the last person in Canadian politics, to level charges at people and actions of being un-Canadian when he called the United States his country, when he talked down this country," Baird said, in reference to a comment Ignatieff made on U.S. television in 2004. A series of Conservative ads targeting Ignatieff's years abroad have included video footage of the 2004 comment, in which Ignatieff described America as "as much your country as it is mine." "In fairness, I think people think it's just a little bit rich for him to be using these kinds of words to describe the prime minister's actions," Baird said. But shortly after the Conservatives released a new flag-wrapped, patriotism-themed campaign ad titled "Our Country," their opponents were quick to accuse the party of finding its source of inspiration south of the border, in the form of an ad from former Minnesota governor Tim Pawlenty in his bid to become the Republican nominee for U.S. president in 2012. Ignatieff also pulled Harper's former relationship with Bruce Carson into the screenings debate, saying Canadians are in a bad place "when you have got a prime minister who does a background check on his audience at a democratic crowd and doesn't seem to do a background check on the people he hires in his Prime Minister's Office." Carson is the former Harper adviser who worked in the Prime Minister's Office until 2008. An investigation into Carson's business dealings by the Aboriginal Peoples Television Network led the PMO to call in the RCMP in March. More of Carson's past fraud convictions and bankruptcies have surfaced in the news in recent days. Harper said during a campaign event in southern Ontario on Monday that if had he known about the past legal troubles surrounding his former aide, he wouldn't have hired him. 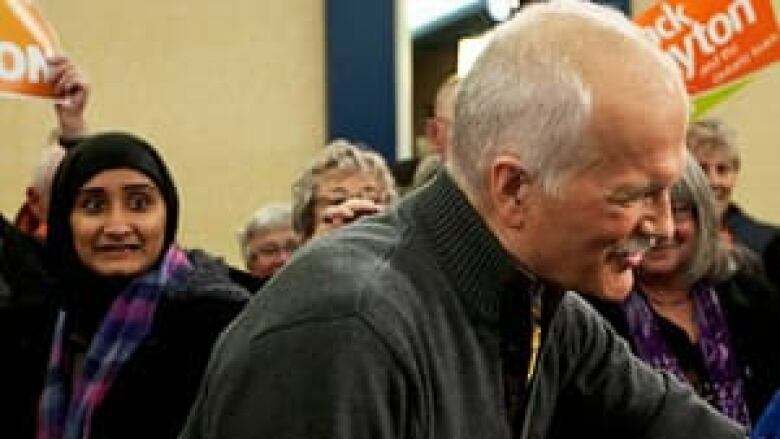 Bloc Québécois Leader Gilles Duceppe joked at his own campaign event that had Harper invited Carson to a rally, the former adviser would have been screened. Meanwhile, at an NDP event in Winnipeg, Layton picked up on the attack on Harper for screening out the university students. Layton said his rallies are open to the public and he encourages people to come out to the NDP events, even if they hold a different perspective on the issues. "The idea that just because you have a different opinion, you can't walk into room with the prime minister that's wrong and every Canadian should be worried about that," Layton said. "Especially when the people that he is letting into the room, like Mr. Carson, have the kind of record they have." Ignatieff did not give up on his criticism of Harper over removing the students from his London campaign event, using Twitter as another platform to take a dig at Harper. "Stopped by Tim's in Hockeyville, Conception Bay South. Real conversations with real people. We didn't check their Facebook friends first," Ignatieff said on Twitter. After being told by the RCMP they were no longer welcome at the Harper event, Aslam said she told the officer they had no intention of causing trouble. "We said, 'We don't want to trouble.' We told him that we just wanted to get informed," Aslam said. "We told him we were not there to cause the trouble." 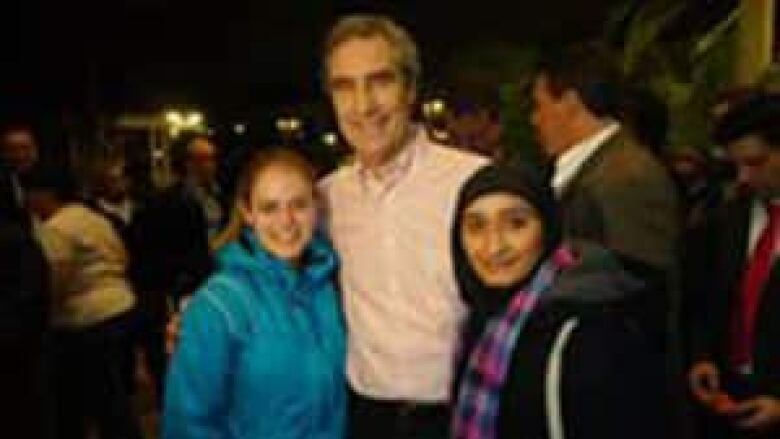 Aslam said she has a photo of her and a friend posing with Ignatieff from an earlier campaign event with the Liberal leader. The university student said she has clicked "Like" on the Facebook pages of each of the three party leaders, so she said she can't figure out why she was excluded. "First, I was really discouraged. People are always talking about how they want youth to vote and we are disengaged but when we want to go and get informed, this happens," Aslam said. Other stories are now emerging of Canadians being turned away from Conservative Party rallies across the country. Izzy Hirji posted on his Facebook page how he and a "handful" of other students were escorted out of a Tory rally in Guelph. Hirji said he was participating in a "vote mob" that greeted the Conservative leader to the southern Ontario city. He said the impromptu gathering at the Conservative election stop was "non-partisan, non-protesting" and simply wanted to discuss student issues. The university student said he had pre-registered to attend the Harper rally, so once the "vote mob" had concluded he went inside to listen. Soon after receiving his name tag and sitting down to listen to the speech, he said he was asked to leave. "They assumed and labelled us as protesters, some thought we were Liberals due to our Canadian attire," Hirji said in his Facebook note. "The RCMP then rudely said, ‘This is a private event. The organizers want you out.' The organizers said, ‘The RCMP identified you, get out or they’ll take you out’. Completely polite, trying to explain I just got cut off and told to leave." Hirji later told CBC News that he felt discriminated against. "I think it's discouraging for youth who want to get involved in politics to see this sort of thing happen and I think we really need to remove the toxic environment from Canadian politics," he said. It isn't just students who are being turned away from Harper events. The Halifax Chronicle-Herald reported on Tuesday that two veterans were also not permitted to enter a Halifax news conference that was held last Friday. Jim Lowther of the Veterans Emergency Transition Team told the newspaper that he and another veterans advocate were told they could not watch Harper's speech. The screening controversy also drew criticism from Harper’s outspoken former chief of staff and campaign manager, Tom Flanagan. "I’m not entirely clear about security requirements once somebody is prime minister. I was not in that position," Flanagan, who served as a senior adviser to Harper until 2004, said Tuesday during a panel interview on Power & Politics with Evan Solomon. "But rallies are supposed to be for the public. I would think you’d want to let anybody in. If somebody misbehaves, maybe they have to be dealt with, but that’s a different issue. So, you know, I really don’t understand the screening. I can’t defend it."